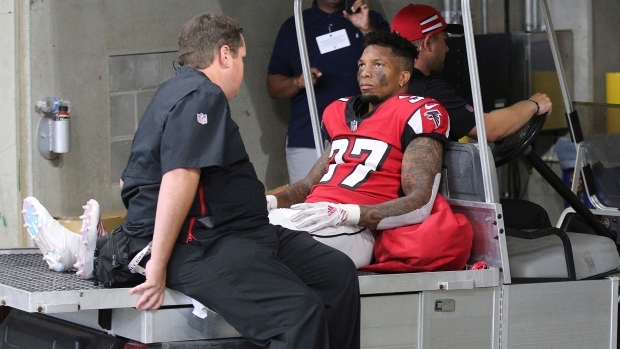 ATLANTA — Falcons starting safety Ricardo Allen will miss the remainder of the season with a torn left Achilles tendon, dealing another blow to Atlanta's already injury-ravaged defence. The team made the announcement a day after the Falcons' 43-37 loss to the Saints in overtime. Allen was carted off the field in the middle of the fourth quarter. The fourth-year veteran from Purdue is the leader of the Falcons' defence. He has played both safety spots and nickel cornerback. That left a void in a unit that lost starting strong safety Keanu Neal to a season-ending knee injury in the season opener. Starting middle linebacker Deion Jones is out for at least eight games because of a foot injury. Neal and Jones were Pro Bowl alternates last season. Atlanta also played Sunday without starting defensive end Takk McKinley, who has a groin strain. Atlanta hosts Cincinnati on Sunday.